Purification Essential Oil blend is excellent at eliminating odors; from skunk smell to doggy odor. Purification can be added to Animal Scents Shampoo or Thieves Household Cleaner for an extra therapeutic and de-skunking bath. Purification diffusion is critical in animal environments for the control of odors, reduction of transmission of disease, and boosting the immune system. 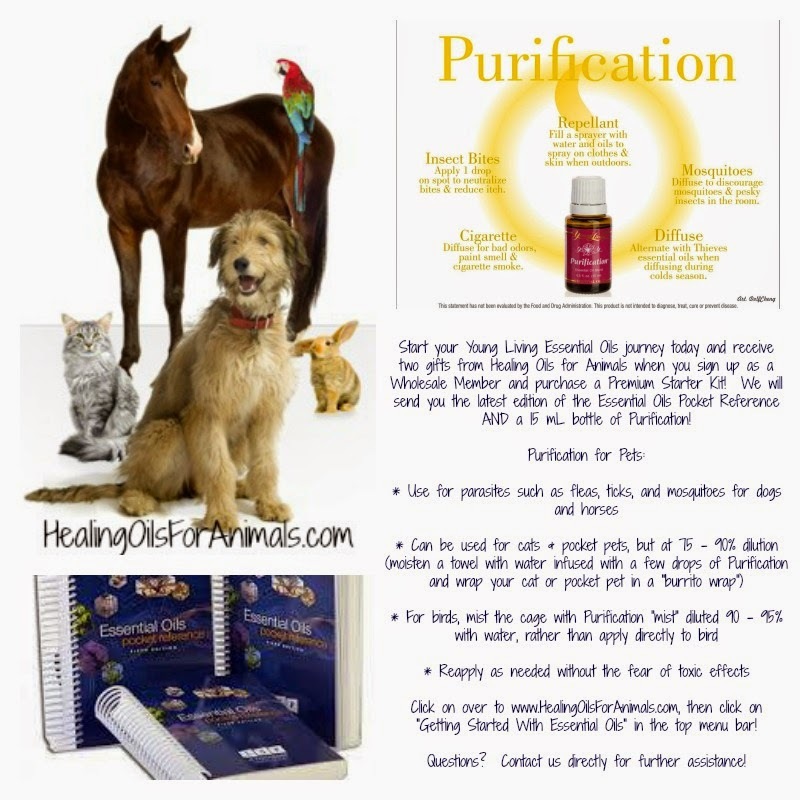 Purification is the "go-to" oil for external parasites as well, and has been used in all species of animals for this purpose. Purification is excellent for kennel cough, fungal respiratory infections, ear mites, ear infections, lacerations, abscesses, wounds, insect bites, insect repellant, external parasites, and upper respiratory infections. Birds & Exotics: Purification has been used in many ways for these animals. Addition into Species Specific Raindrop Technique, water mister (4 drops in 4 ounces of distilled water), direct topical application (neat and diluted), addition to soaking water (1 drop per liter), water diffusion (including caging and tenting), addition into Animal Scents Ointment or Shampoo (1 drop per tablespoon), and via Petting (diluted or neat). Oral use is not generally used in these species. Cats: The most cat-friendly ways to use Purification is by addition into Kitty Raindrop Technique, water diffusion (including caging and tenting), Petting (neat or diluted), water misting (when tolerated), direct topical application (diluted or neat ~ especially for ear mites and abscesses), and Litteroma. For Ear Mites, 1 drop of Purification is places onto a cotton swab and swabbed inside the infected ear. Care must be taken not to have oil drip directly into the ear canal. Please consult the ADR for more explanation into these conditions. Oral use in cats is generally limited to ingestion by grooming. The blends can largely be used much more extensively in these species. If a blend is indicated for oral use in humans, then it can generally be consumed for these species quite easily. All of the methods of application can usually be used, including insertion into Raindrop Technique, water and air diffusion, Petting (neat or diluted), direct topical application (diluted or neat), addition into various carriers (Animal Scents Ointment, V-6, Massage Oils), or added to pools and soaking water. Purification is not commonly used by ingestion. These statements have not been evaluated by the Food and Drug Administration. This product is not intended to diagnose, treat, cure or prevent disease. These posts are for informational purposes only. Frankincense of the carteri variety is often referred to as “regular Frankincense” as opposed to Sacred Frankincense. Frankincense is likely one of the most important and well used oils in the animal world. It has been used with every species, in almost every way imaginable. It is incredibly safe, well tolerated, versatile and effective. Major conditions in which Frankincense is used include all forms of cancer, tumors, cysts, behavioral conditions, depression, brain disorders, seizures, immune system stimulation and regulation, autoimmune disorders, DNA repair, and more. 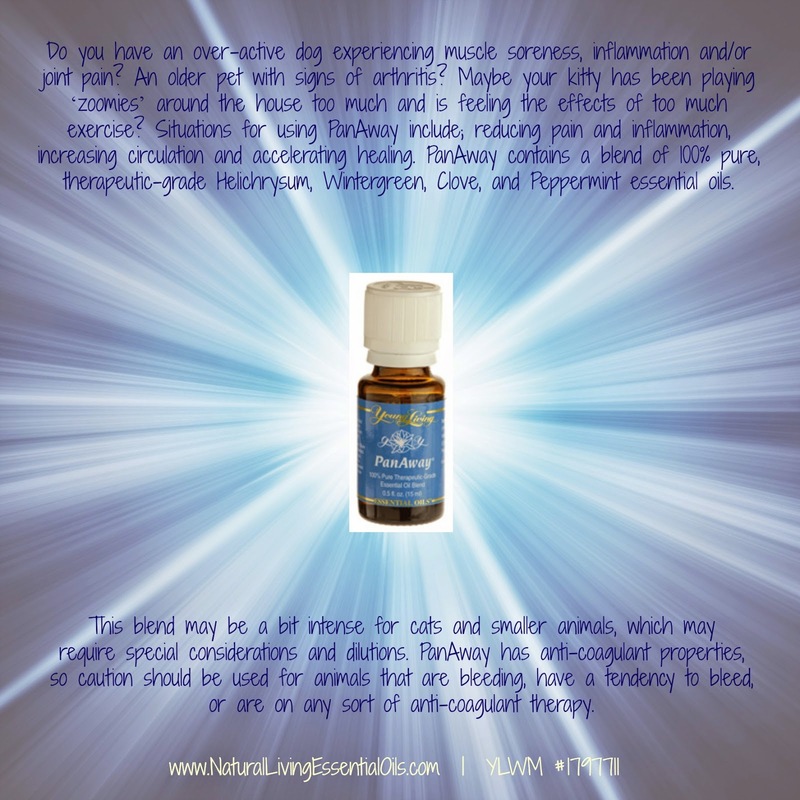 Frankincense is considered a "life force" oil and has been used extensively in critical cases in many holistic veterinary hospitals. The use of Frankincense in times of transition and death is incredibly helpful to the animal, as well as to the animal's guardian. Frankincense also appears to magnify and enhance the effects of other essential oils when they are used concurrently. Frankincense is also found in many essential oil blends and products, which can be utilized in animals. Frankincense has been used many, many ways in all animals: butterflies have dipped their feet in it, honey bees have had cotton-ball diffusers placed in their bee hives, birds have been misted with water-based solutions, fish have had it added to their aquariums, it has been ingested in large amounts in many species, rabbits and guinea pigs have been pet with it, and it has been diffused in a variety of ways. 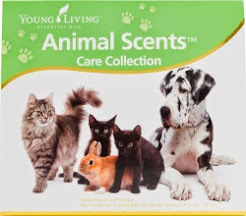 Common ways to use Frankincense on all animals including Birds & Exotics, Cats, Dogs & Large Animals: Adding one drop or more to 1 liter of drinking water, adding one drop, (or more) to 1 tablespoon of food, adding to a Species Specific Raindrop Technique, water misting with 4 drops(or more) added to 4 ounces of distilled water, via petting (neat or diluted) direct application (neat or diluted) indirect diffusion, and water diffusion. 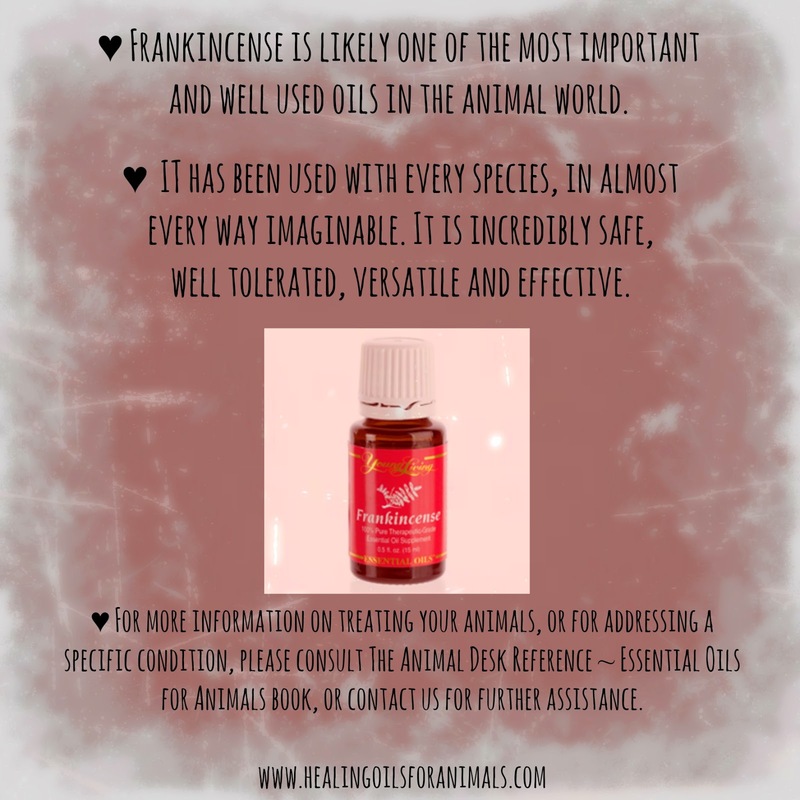 For more information on treating your animals, or for addressing a specific condition, please consult The Animal Desk Reference ~ Essential Oils for Animals book, or contact us for further assistance. Or, why not join my team and learn how to help others with health & healing for their animals, detoxifying their homes, replacing their medicine cabinets, and healing themselves and their families!! Essential oils are indeed the original medicine, so get started on your amazing essential oils journey today! NingXia Red is a whole food drink made from several "super foods" and also contains the essential oils of Orange and Lemon. 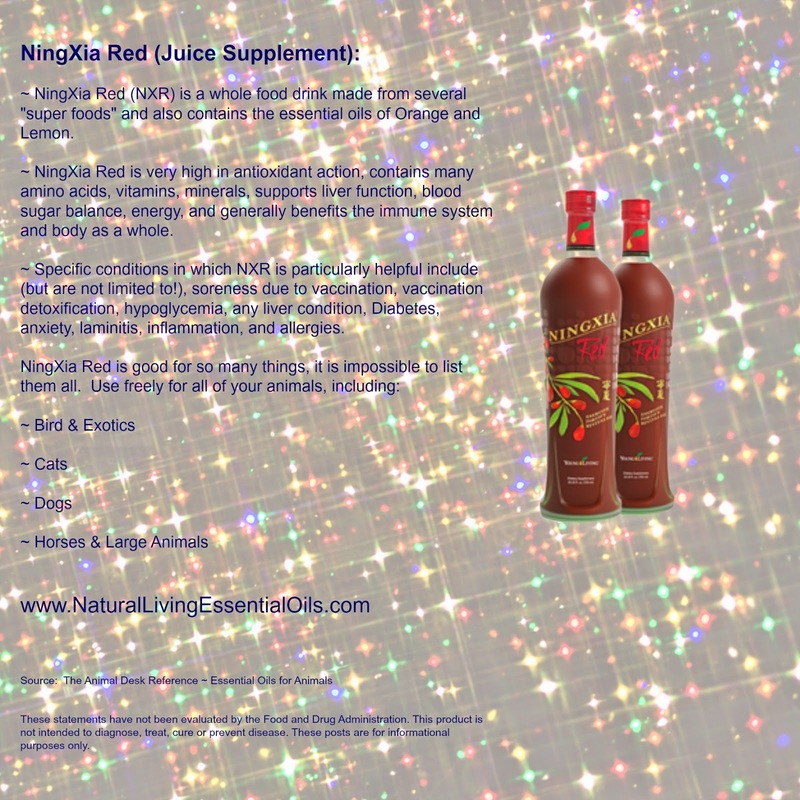 NingXia Red is very high in antioxidant action, contains many amino acids, vitamins, minerals, supports liver function, blood sugar balance, energy, and generally benefits the immune system and body as a whole. NingXia Red is good for so many things, it is impossible to list them all. In any condition listing where NingXia Red (NXR) is not listed, you can guarantee that the addition of the juice to the regimen will be beneficial. NXR can often be used as a carrier oil for other supplements and essential oils when internal use is desires, and can even be used externally within various poultices and topical applications. Specific conditions in which NXR is particularly helpful include (but are not limited to! ), soreness due to vaccination, vaccination detoxification, hypoglycemia, any liver condition, Diabetes, anxiety, laminitis, inflammation, and allergies. Birds & Exotics: As general maintenance approximately 1/2 teaspoon can be given per day. Some animals require and crave more, and in general they are allowed to ingest what they desire. However, it is wise to make sure the amount they are given is gradually increased to avoid diarrhea or problems from a sudden food change. During injury or illness, much higher volumes of NXR are consumed. Cats: Some cats love NXR and some cats seem to loathe it. It is, of course, their prerogative and they are quite certain you should know about it! Many cats will accept small amounts of NXR Red added to their drinking water, but it must be made fresh frequently. Many cats will eat NXR mixed into some healthy, premium canned food, and there are some who will drink NXR straight. For general maintenance, cats can consume approximately 1/2 teaspoon per day. During injury or illness, 1 tablespoon or more can be given, and is ideal if the amounts are divided up into more frequent doses. Dogs: Dogs are quite easy to give NingXia Red to. It can be added to foods, or offered in a bowl (straight or diluted). General maintenance varies depending on the size of your dog. Senior dogs, or dogs with any sort of health complaint can generally receive double maintenance amounts on a long-term basis. During injury or illness, triple amounts or more are given, gradually increasing amounts to avoid diarrhea or problems from a sudden food change. Horses & Large Animals: NingXia Red can be given straight, added to water, or mixed with various feeds or hay. For general maintenance, 1-2 ounces per day can be given. For performance horses and animals, often 3 ounces per day is given. During injury or illness, 4 ounces or more can be given. During laminitis episodes in horses, the consumption of 4 ounces or more of NXR per day has greatly reduced the duration of illness and eases pain and inflammation. Thieves contains Clove, Lemon, Cinnamon Bark, Eucalyptus radiata, and Rosemary. Thieves is an incredible mainstay in animal therapies. With antiviral, antifungal, antiseptic, antibacterial, and immune-boosting properties, there are many indications for its use. 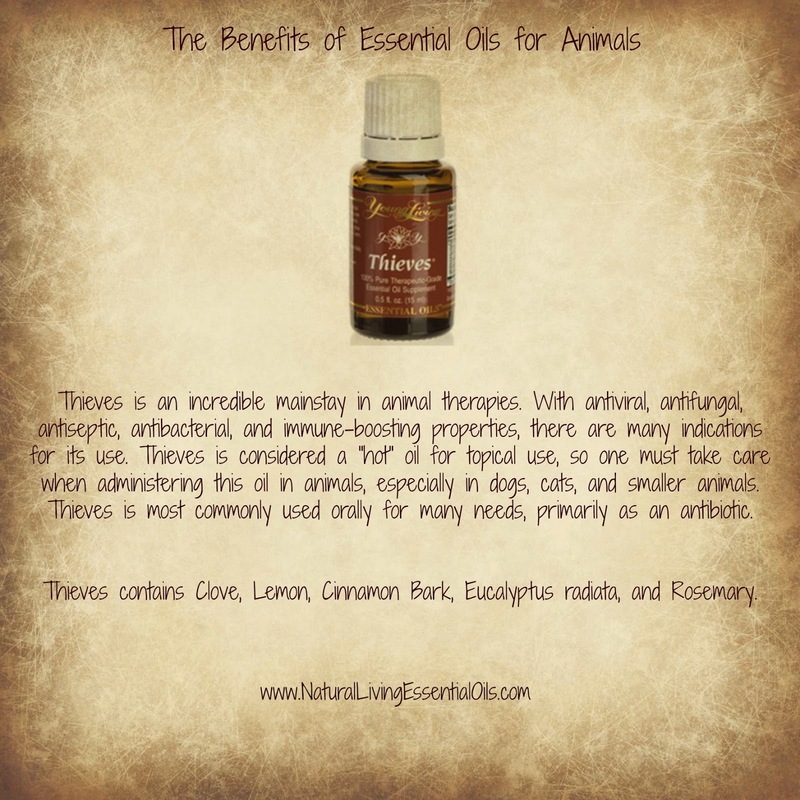 Thieves is considered a "hot" oil for topical use, so one must take care when administering this oil in animals, especially in dogs, cats, and smaller animals. Thieves is most commonly used orally for many needs, primarily as an antibiotic. The general diffusion of Thieves is also found to reduce allergy symptoms both in humans and in animals. Thieves diffusion also reduces the desire of insects and external parasites to stay in the vicinity of the diffusion. Birds & Exotics: Water diffusion of Thieves is the most common route of administration, and is often performed with caging or tenting (3-4 drops in the diffuser). Thieves can be added to foods, but is not often added to drinking water due to the "hot" nature of the oil blend. Indirect diffusion of Thieves is commonly used as well by placing a drop or two on cotton balls or on cage papers. All respiratory conditions will benefit. Cats: Thieves is generally used for cats as described within all of the guidelines when used for birds & exotics. For oral consumption, please refer to the Animal Desk Reference guide. Dogs & Larger Animals: There are so many conditions that benefit from the use of Thieves essential oil that it is difficult to list them all! Ringworm, fungal skin infections, bacterial skin infections, and more benefit from additional Thieves added to Animal Scents Shampoo, Thieves Household Cleaner, or Animal Scents Ointment for application. Any hoof condition in a horse seems to benefit from neat Thieves application, even laminitis. Application amounts and usage in combination with other Young Living products vary, so please ask the person who invited you to consult the ADR for further description of products, and for more information on their many uses! Do you have pets with some of these issues? An over-active dog experiencing muscle soreness, inflammation and / or joint pain? An older pet with signs of arthritis? Maybe your kitty has been playing ‘zoomies’ around the house and is feeling the effects of too much exercise? Situations for using PanAway include ~ reducing pain and inflammation, increasing circulation and accelerating healing. Wintergreen, Clove and Peppermint essential oils. tendency to bleed or are on any sort of anti-coagulant therapy.